Simple Savings For ATL Moms received a Red Gold gift box that contained great products from Red Gold and they have used their tomato products in everything! Products were sent directly from the company for their opinions of their product. If you have never tried them, consider trying their products today. The tomatoes come in the can and from her review, when you open the can and place them onto your plate, you can see the freshness of the product! They pick their tomatoes at the peek of freshness. Some of their products are being given away in a wonderful crafted gift basket with great cooking products including 2 wonderful cans of Red Gold tomato products. 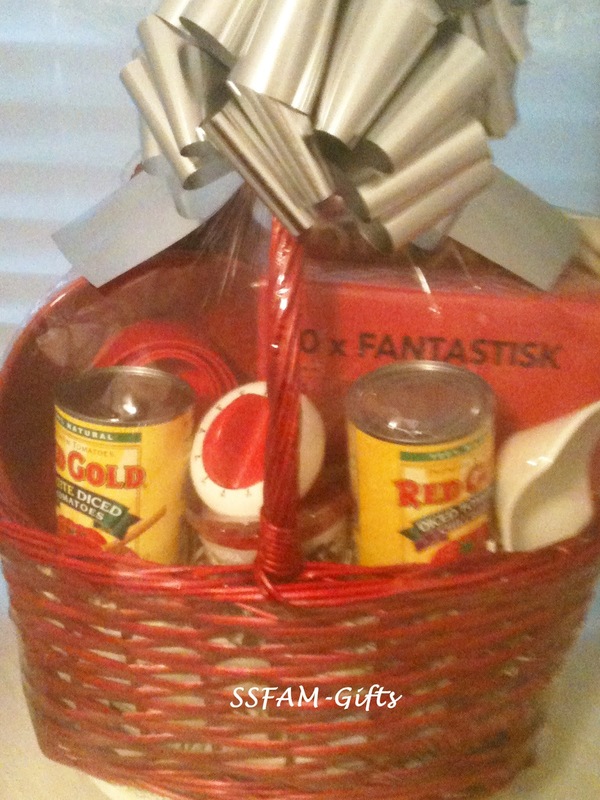 Other items included in the gift basket are a red/white apron, red napkins, red measuring cups, timer, candle, spatula, tongs, bowl, oven mitt and crafted in a beautiful red keepsake basket with wonderful decorations! It is a perfect gift for a new chef, someone who enjoys the color red as well as cooking, etc. Giveaway open to U.S. residents! Great Recipes from Red Gold! ***Red Gold is now available at Publix! Products do not contain MSG! Products are generally gluten free! Learn more about the fruit and veggie challenge from the White House! 14 Simple ways to $ave on Fruits &Vegetables! 1- Visit large grocery stores like discount grocers to find deals on vegetables/fruit. 2 - Buy larger quantities and consider freezing or canning. You can also cut apples in slices and place in zip lock bags for quick health snacks! 3 - Consider store brands to reduce cost. 4- Check out local deals with farmers. 5 - Use your fruit in more than one meal. 6 - Barter with your friends who grow their vegetables. 7- Check the clearance section of stores. 8- Watch for special deals on vegetables including canned goods. Be sure to look for low sodium, carbohydrate and fat canned vegetables/fruit. 9 -Create your own sauces. 10.- Try new vegetables or fruits. 11.- Buy fruit and vegetables in season. 12. -Avoid fruits or vegetables that are bruised or damaged. 13.- Clean your fruit to prevent any harmful organisms. 14.- Keep the refrigerator temperature set below 40 (F). How do you save on purchasing your vegetables? Have you ever tried Red Gold products? If so, did you enjoy them? Disclosure: I was provided compensation from SSFAM in promotion efforts of their review! The gift basket is made from Simple Savings For ATL Moms blog owner. I just try to buy store brand items (if they aren't nasty LOL) and if I have to buy name brands, I try to have coupons. I always plan meals ahead of time, so I can make a list for just what I need. I will buy the meat marked for quick sale and freeze it. During the week I'll pull something out from my stock pile and thaw it for something. Last week I cooked a beef roast with yellow squash, gold potatoes, carrots, and sweet onion in the slow cooker.